Rudy Pensa has plenty of cool Strat types on his site, but I'm steppin' outside with Miss T here, who has ample Strat-o-features. A sweet hybrid, this jewel features 3 Kent Armstrong lipstick pups, Strat type trem and an alder Thinline body. 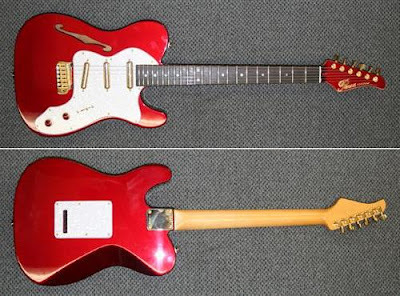 Pickguard and trem cover are white pearl (click image for clearer pics), gold hardware and candy apple red paint. She oughta be one fat quackin', Blues smackin', burnin' urn of funkaliciousness! Enough to make a Strat man leave his happy home. Just my imagination, runnin' away with me. Next time any NYC bro's get a chance to visit Rudy's Music Shop, I expect you to procure a test drive and send me a full performance report! Friday Strats Pin It Now!